The BMW i3, billed as an all electric urban car, will have an option for a gasoline range extender that will offer a total driving range of 250 miles. At the North America International Auto Show (NAIAS), BMW showed a range extender option for the all electric BMW i3 that adds about 150 miles of range. The BMW i3 is one of that company's upcoming electrified vehicles, and has been billed as an all electric car designed for urban use. The other of those cars, the BMW i8, is a plug-in hybrid sports car. The range extender option for the i3 essentially adds a third model to the BMW i series, a plug-in hybrid version of the i3 which is unlike every other plug-in hybrid on the market. The BMW i3 was originally dubbed the MegaCity, giving away BMW's intention for the i3 to primarily be driven around town. Indeed, the majority of daily driving is 40 miles or less per day and, the BMW i3 has an electric range of 60-90 miles (not yet verified by the EPA). While it is logically obvious that any electric car can handle average daily driving with ease, there is the "range anxiety" bugaboo causing some prospective electric car buyers to shy away. BMW notes that with the MINI-E trial, where the company placed hundreds of electric MINI's under lease with customers, over 90 percent of the driving needs of MINI-E participants were satisfied by the MINI-E's range. At the same time some of the MINI-E customers wanted a longer driving range than BMW was willing to install in an electric BMW. The solution developed by BMW is a small two-cylinder motorcycle engine from BMW's motorcycle division. That engine is coupled with a generator, not in any way mechanically connected to the wheels, and is used solely to recharge the battery pack if needed. The engine is housed in the trunk area and presumably consumes some storage space. 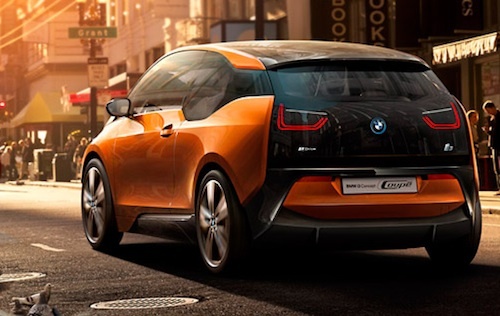 The added cost of the range extender engine will not be known until the global launch of the BMW i3, that is expected to occur during Q4 2013. BMW began a world tour of the i3 and i8 in May 2012. BMW launched phase two of the company's electric vehicle field trials, with the ActiveE program that began a year ago. Phase one was the Mini-E trials begun in June 2009. The point of the range extender for the BMW i3 is not to deliver the same performance level in range extension mode, but to provide a sort of "limp home" mode. The i3's electric drive train delivers 125 kW/170 hp, and a peak torque of 250 Nm (184 lb-ft), but not while running in range extender mode. The i3 will also have SAE DC Fast Charge support that will give an 80 percent recharge in about 30 minutes. One wonders why, for a car with fast charge support, there is interest in adding a gasoline engine. This is the length to which BMW seeks to comfort range anxiety concerns. This version of the BMW i3 is unique among plug-in hybrid vehicles. So unique that California has created a special category, called BEVx, for which the BMW i3 is expected (at this time) to be the only qualifying vehicle. Additionally this version of the BMW i3 will qualify for the white HOV stickers in California, because this car has its own category. This BEVx category was approved in January 2012 by the California Air Resources Board (CARB). To qualify as a BEVx, the vehicle must have at least 80 mile electric range, and the whole result must be super ultra low emission vehicle (SULEV) and zero evaporative emissions compliant and TZEV warranty requirements on the battery system. Some automakers proposed to CARB the concept of an all electric vehicle with a small auxiliary power unit (APU). BMW is simply the first one to deliver on the idea. This is one approach one car maker has taken to address the range anxiety concern. Another model could be to offer the APU for rent, as needed, rather than a purchased item bought with the car. That way if you know you're heading out for a longer trip, you head to the dealership to rent an APU just like heading to the ski shop to rent ski's. Another model is, as Tesla Motors has done, to offer multiple battery pack sizes so that the car buyer purchases the range they desire (85 kilowatt-hour 265 miles, 60 kilowatt-hour 208 miles). It is up to the automakers to put different options in front of car buyers, to see which model will gain traction. Somehow I don't see the DOT officiating a motorcycle engine on an electric vehicle, especially as emissions stand now with conventional motorcycles, which is to say loose at very best. It would be interesting to find out what kind of emission system BMW plans to put on it to meet the BEVx tag. Either that, or I'm missing part of the equation. Well, yes, it is going to be modified and have emissions equipment. Just because it's sourced from a motorcycle doesn't mean that stuff can't be added or that the motor can't be modified, right? Yes, as much as it makes sense, it would also take a lot of power from it. Emissions on gasoline motorcycles is lax at best, which explains their high power output. Let's see, electric car with small aux IC engine in series hybrid mode... Wouldn't that be a Chevy Volt? The engine is not connected to the wheels, so it is different than a Volt. However, I wonder about adding yet another confusing acronym, BEVx? It's in a different vehicle class because the engine is much smaller than the one in the Volt.